Forests play an integral role in the Earth's climate, and each forest type - tropical, temperate and boreal - has varying impacts on the climate, serving to both cool and warm the Earth. Credit: Nicolle Rager Fuller, National Science Foundation. Last Friday Science published their special issue entitled ‘Forests in Flux’. The issue focuses on the future of the world's forests in light of unprecedented change, largely resulting either directly or indirectly from intensifying human activity. 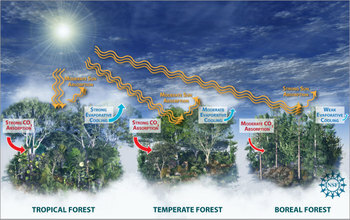 Amongst the News reports, Perspectives articles and online podcast and video, a Review article caught my eye which explains how forests influence climate through physical, chemical, and biological processes. ‘Forests and Climate Change: Forcings, Feedbacks, and the Climate Benefits of Forests’, by Gordon Bonan of the National Science Foundation's National Center for Atmospheric Research in Colorado, presents the current state of understanding for how forests impact global climate and emphasises the importance of gaining a better understanding of these influences as forests become more central in global warming mitigation policies - "Forests have been proposed as a possible solution, so it is imperative that we understand fully how forests influence climate." Changing Governance of the World's Forests. Arun Agrawal, Ashwini Chhatre, and Rebecca Hardin. Science 13 June 2008: 1460-1462. For more information on the affect of human activity on the biosphere, keep an eye out for our new internet resource, Environmental Impact www.cabi.org/environmentalimpact - coming soon!